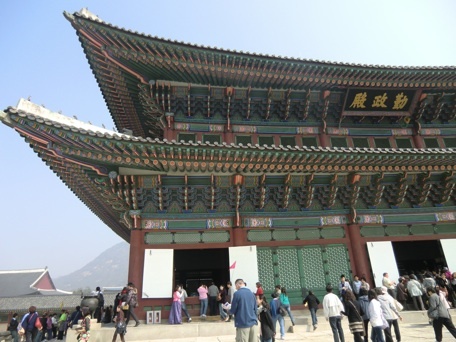 Deoksugung Palace, one of the 5 palaces of the Joseon dynasty. It was inhabited until 1919. Interesting are the various buildings in completly different architecture on these premises. 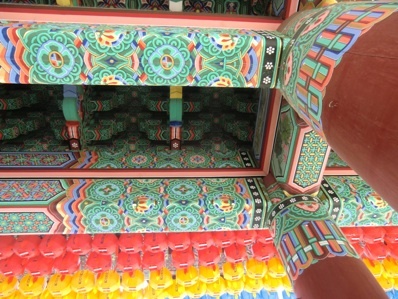 A detailed view of the colorful painted wood on the temples. 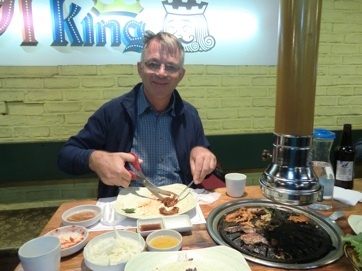 Dinner at King Restaurant with all-you-can-eat meat BBQ for only 14.500 KRW p.p. (= 10 euros). After our beer we ordered what all our table neighbours had, a soju (rice wine). 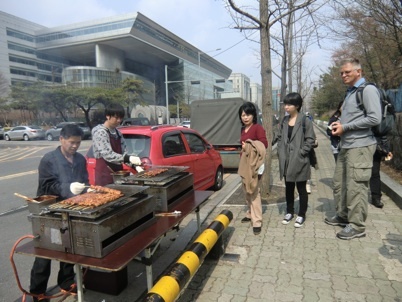 As you can see, Koreans use scissors to cut meat, kimchi etc. 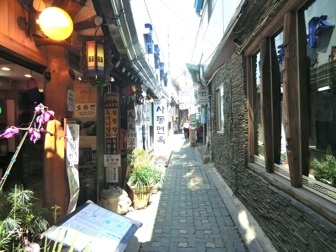 A typical backstreet in Seoul with millions of restaurants. 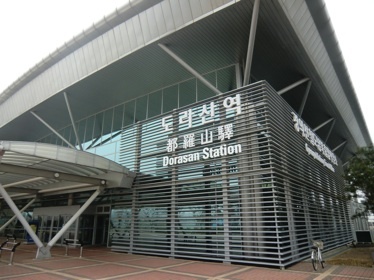 Following an agreement between the two Koreas Dorasan station was opened in April 11, 2002. Sometime it was supposed to complete the Trans Eurasian Railway Network. 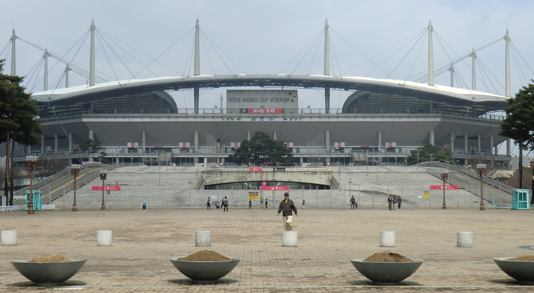 In December 2007 freight trains began traveling north past Dorasan Station into North Korea, taking materials to the Kaesong Industrial Region and returning with finished goods. Unfortunately after a year, North Korea closed the border and since then the station with the adjacent hangars are empty. 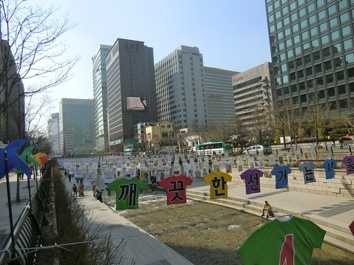 Only two trains rain to a nearby South Korean city, Munsan. A rescued locomotive from the Korean War and the barbed wire of the Civil Control Line with ribbons of families with relatives in North Korea. Access ramp to the 3rd tunnel. 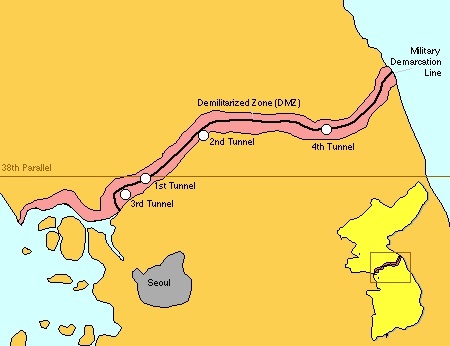 Only 44 km from Seoul, the tunnel was discovered in October 1978. 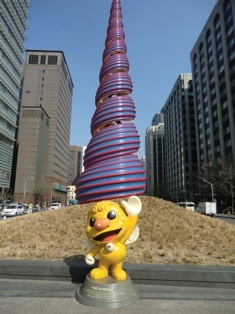 It is 1.7 km long, 1,7 m high and 2 m wide. It runs through bedrock at a depth of about 73 m below ground. It is apparently designed for a surprise attack on Seoul from North Korea and could easily accommodate 30,000 men per hour. A total of four tunnels have been discovered so far, but there are believed to be up to twenty more. 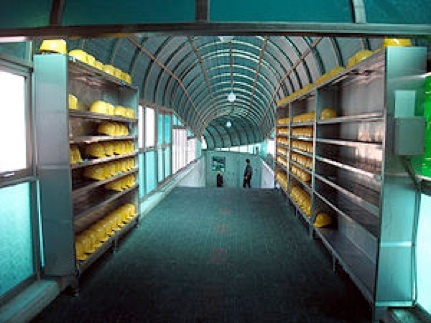 Initially, North Korea denied building the tunnel and declared it officially part of a coal mine; black "coal" was painted on the walls by retreating soldiers to help confirm this statement. 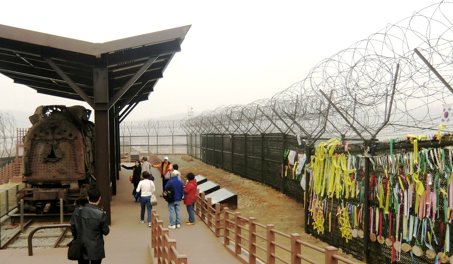 The South Koreans have blocked the actual Military Demarcation Line in the tunnel with three concrete barricades. The tunnel is now a busy tourist site! A road that is built over the river Han. 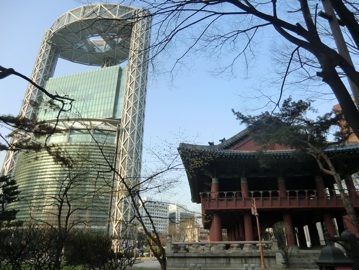 Contrast between modern Seoul -here at the Yeouido Park South of Han River- and the area around Dongdaemun Market. Flight from Frankfurt to Seoul Incheon Airport in business class. On 11-11-11- we got an advertisement from Lufthansa with a special price for a return ticket in business class for 1.111 euros on 11-11-2011. We took, of course, advantage of the Business Lounge at the airport and then we really enjoyed having so much space in the airplaine. Also the food with the drinks was excellent. Our flight took only 9h45 and we have a time difference of 7 hours with Germany. We took off at 18:30 and landed at 11:15 in Seoul. Immigration etc. was no problem. With the bus 6005 we drove about 3/4 hours to our hotel Vabien II in Jung-Gu. We had to wait for our room that only became available at 15:00 so we walked where we thought it looked nice. 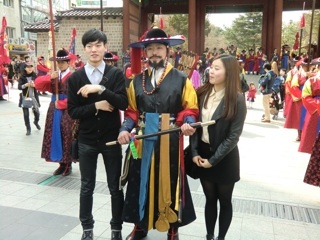 By chance we arrived to the Seoksugung Palace where there was the Chaning of the Gards. After a nap of 1,5 hours in our hotel we went to the 19th floor of our hotel and observed where it looked interesting from here above. 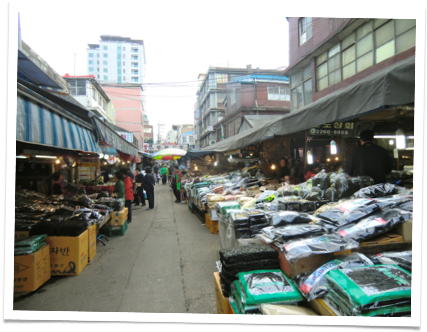 So we ended up waling to the Namdaemun Market where we had a simple dinner at a humble restaurant (15.000 KRW = aprox. 10 €) close to the market area. Afterwards we discovered that the market had even other streets with other kind of restaurants. 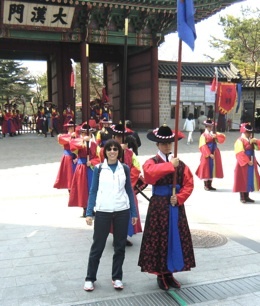 Visit of Jogyesa temple, Gyeongbokgung Palace, Folklore museum, and a quick glimpse on the Blue house (presidential residence). 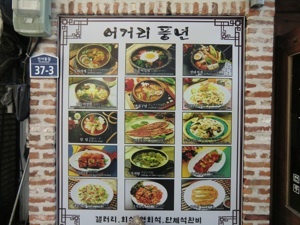 After that we walked on Insadong-Gil Street and had a fish-vegetable stew lunch. This was too hot for me, so afterwards I compensated it with a plain delicious “churro” (1.000 KRW), Volker with a Korean ice-cream (3.000 KRW). 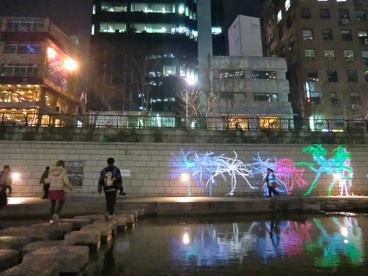 Walk along the Cheonggyecheon River which was landscaped with many special features like waterfalls, footbridges etc. In the evening we were there again to see the so-called digital garden. Dinner with a bokkeum where we could choose the meat and grill it our table, wrap it in perilla (kind of big mint leaves) or lettuce leaves. This was an absolutely delicious meal even though we were both convinced not to be very hungry... We managed to get my European SIM card working today going to the SK Telecom World Centre near the Jong-No tower (taxi 2.400 KRW). 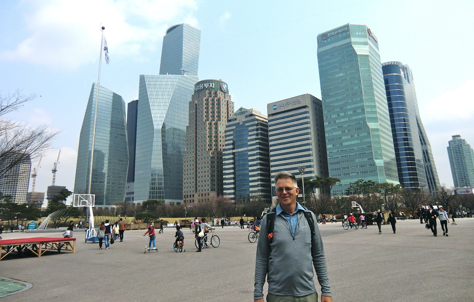 In the evening we drove back with a taxi from about the same place (6.100 KRW surcharge for ride after 10 pm). We had to get up early this morning to get our shuttle to the shuttle bus -after getting people in other hotels etc. 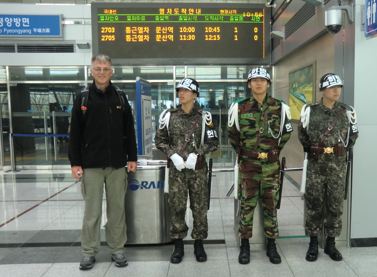 for about 1,25 hours- that took us to the last tour bus in the Demilitarized Zone DMZ along the North/South Korean border which lies only 56 km from Seoul. 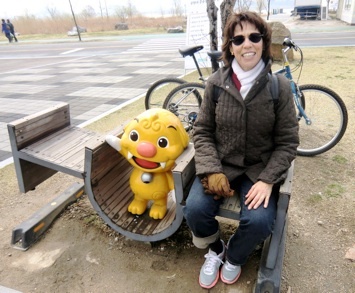 We visited the Imjingak Park (or “Resort”! 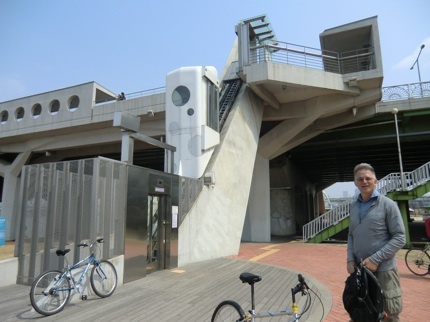 ), The Dorasan Railroad Station, the Dora Observatory, and the 3rd infiltration Tunnel. This was very interesting and we were tired after the long journey, but we still managed to take a taxi to the Lotte Department Store, to have a meal “jjimdak” -chicken pieces with noodle-, a speciality of Andong- and a coffee with cake at a coffee shop close to the Lotte Department Store. Back home with the metro and laundry with the spectacular washing/drying machine in our room. This morning when we looked out the window, were surprised that we saw NOBODY walking on the streets at 8:00 am. Then we were reminded that it is election day, a holiday. Today we wanted to walk up to the city wall in Bukasan which lies higher (320 m) but it was so foggy this morning that we changed plans and went with the metro (1300 KRW p.p.) 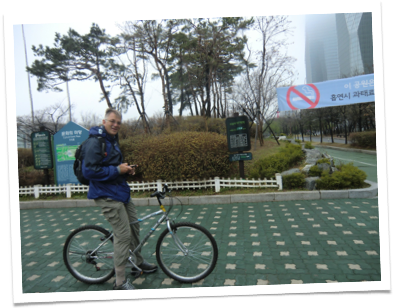 to Yeouido Park and rented a bicycle (1 hour: 3000 KRW per person, 3 hours: 15.000 KRW). We were the first ones I guess. Weather looked unstable and it was pretty cold but shortly after the sun started coming out as well as the people. 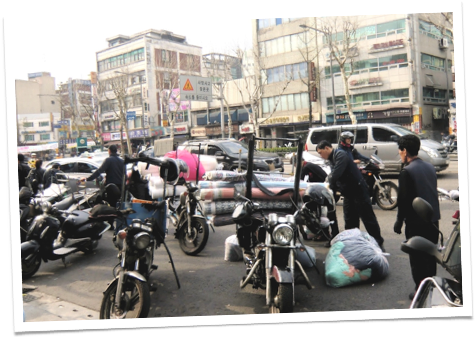 When we came back at 2 pm to return our bikes, the place was full with people. 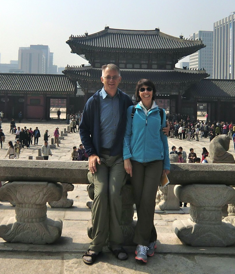 We had a light snack with a delicious grilled chicken on a skewer (dakkochi) from a street stand and then we took the metro to Dongdaemun Market. 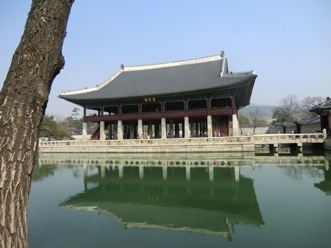 This is a place quite opposite to the other modern Seoul areas. People deliver stuff on motorcycle what you would normally see on a lorry in Europe, then they carry it like 100 years ago on a rack on their back or push it through the streets like I remember the images from China 30 years ago. The market itself consists of thousands of narrow small stalls selling the same things, like fabrics, ribbons, buttons, decoration stuff. Because it was very crampy and crowded in there we walked along other streets with all kind of small specialized shops and ended up in a backstreet of Samildae-Ro (not so far away from the Jongno Tower) where we found a very good, simple restaurant where we had wild pork stew (pretty spicy) and some kind of tempura with different vegetables and meat. 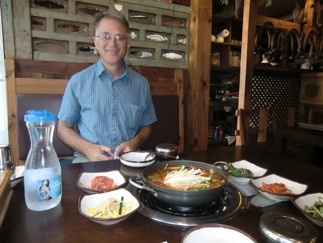 Of course with soju which helped me eat the hot stew soup. After this we had a surprisingly good coffee at Dunkin’ Donut (there are thousand of these in Seoul, like Starbuck, Texas Bar and, of course McDonalds...). 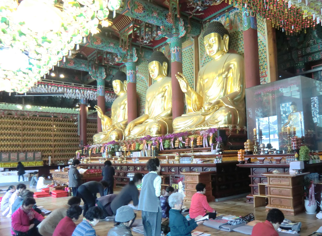 We drove with a taxi to our hotel (2800 KRW) and packed for an early leave next morning.